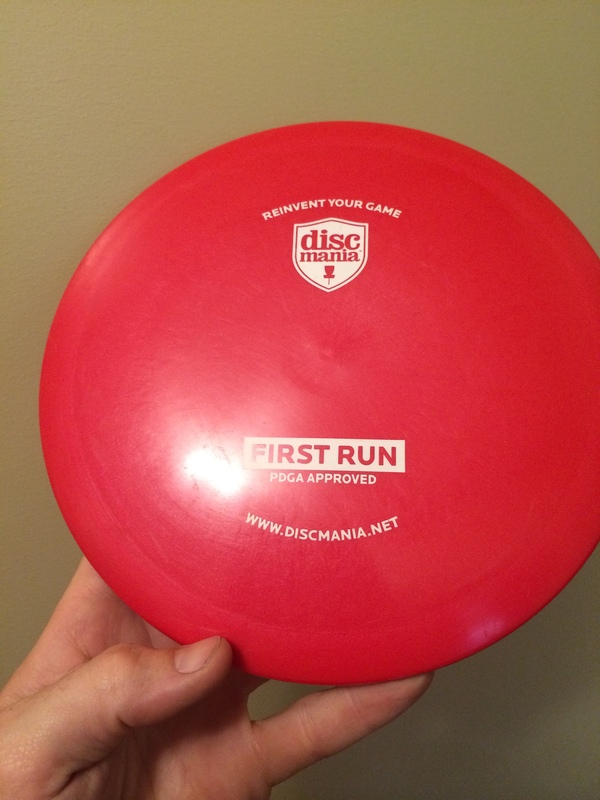 Discmania G-Line FD, max weight 175g. Can you say hyzer-flip? If you can, please make sure to actually say “hyzer-flip” every time you throw a hyzer that flips. OK, absurdity aside, this disc is a hyzer-flip machine. After throwing it for the past 3-4 weeks, I’ve already started to rely on it. It’s one thing when a new disc makes it into your bag for a few rounds, but it’s entirely different when a disc starts to be thrown off the tee consistently. The G-Line FD at it’s core is a flippy fairway driver. For the first week that I threw it, there was a bit of ‘fight’ in the way it would turn and then eventually fade. In other words, I could throw it pretty hard and level and it would go straight. That behavior stopped fairly soon (like I said about a week) and the disc started to shine in a big way. I now use it for low powered straight shots and higher powered anny shots. I don’t really throw rollers, but my assumption is that the G-Line isn’t as good for rollers because of the flex. If you turned this disc into the ground hard, you’d lose a lot of the inertia into the plastic itself as it wobbled and flexed. Last weekend I played a fairly large tournament (Maple Hill Open AM Side) and I used this disc on multiple holes to get the birdie, as well as a nice uphill, pancake tomahawk throw. If you’re familiar with Maple Hill in Leicester, MA- holes 14 and 15 on the white layout are essentially straight and narrow shots. I’m not sure on the distance off hand, but they are holes that touring pros could throw midrange on, but since I’m not a professional I need a fairway driver to have a chance at the birdie (I could reach with a middie, but I’d have to throw too hard and would lose the accuracy). I started getting into a groove with my red Discmania G-Line FD where I could dial down the power to the point where I almost had my eyes on the target for the whole run up, and I could hold my follow-through nice and steady. It gave me a boost of confidence to have the added accuracy. Later on in the tournament I was struggling to remain under 70 at Buffumville Dam, but on the last hole of my round I threw a nice hyzer flip pin high to birdie hole 5 (295 ft) and put my FD about 18 feet from the basket. This secured a 69 for my round, and was essentially my only highlight of the day. I think it’s the glide that sets this disc apart from other fairway drivers. It always seems to do more than you ask it to. I told someone it threw like a longer Leopard, and he replied that “…a Leopard throws like a longer Leopard if you throw it longer.” He’s a fan of the Leopard no doubt, as am I. I actually don’t think this disc is fighting for space against my Leopard yet. For now it occupies a space of it’s own. I tend to try to throw the FD further, and I reach for it on uphill shots quite a bit. My go-to Leopard is actually a very stiff, stable, Star Leopard and I throw it where a lot of folks would throw a TL or a Teebird. In case you don’t know, the G-Line is the same as the G-Star blend. It’s a flexible plastic with huge grip. The snap that you can generate with this plastic is off the charts, but I tend not to over do it on my grip with the FD because it’d risk turning the disc into the ground. That being said, the disc isn’t so flippy that it “turns and burns.” It has a controllable and slow turn, and once you get to know it (it took me about a week), the shots are easy. It’s funny how I waited this long to try any of Discmania’s molds, and now that I’ve started to test out 4 of their latest releases in a new plastic I’m just starting to see what I’ve been missing. I wonder if I would’ve liked them as much in the other plastics. I wish I could compare this G-Line FD to other plastic blends, but it’s probably a predictable result. The C-Line or clear plastic is bound to be more stable and wear slower, where the S-Line is bound to be similar if just a tad more stable because of the stiffer plastic. Conclusion: yummy. The FD is the RD and can be a GT for HF’s. This entry was posted in Equipment and Gear and tagged disc, discmania, equipment, fd, g, golf, innova, jackal, line, review, star. Bookmark the permalink. I have two 175 s-line FDs. I love them. At almost any power, they show gentle turn until a very light fade at the end. Easy to hyzer-flip, but they tend to flip to a gentle turn, not to super straight. Even if I throw at 100%, they will turn gently. And amazing glide! These are easily my longest flying fairway drivers. I can pass 400 ft without much strain. … I have one 172 c-line FD. I love it too, but for completely different reasons. It’s basically a Teebird. Straight and resistant to turn, followed by fade of +2. This guy likes the 275-350 ft range, and getting past that is challenging. From what I’ve read, I may have a 2nd-run c-line FD, which became the prototype for the FD2. In the hand, it feels like a Teebird minus that tiny bead on the edge. … From reading your review, it sounds like the new g-line FDs are like my s-line FDs, but perhaps with a little more turn out of the box.